Crane Market size was valued at around USD 17 billion in 2016 with over 25,000 units sold, and will grow at approximately 2% CAGR from 2017 to 2024. 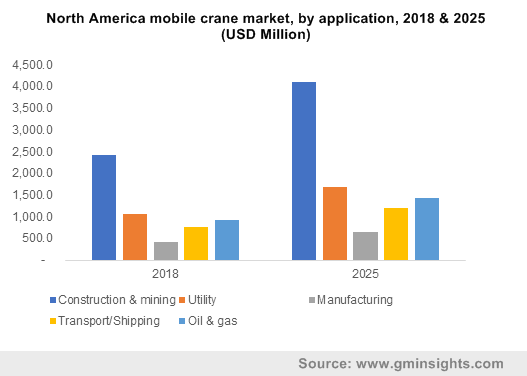 The proliferation of the internet and mobile connectivity globally is a major factor promoting the crane market growth. Government initiatives to provide telecommunication facilities to secluded rural areas is driving the demand for mobile and tower cranes as the installation and maintenance of telephone lines require the usage of cranes. Internet connection is a prerequisite for smart homes and internet of things (IoT) applications and is predicted to grow substantially over the coming years. Rentable mobile and tower cranes can cater to the demand without the need for purchasing and ownership of the equipment. In the utility industry, mobile cranes are being increasingly used for power grids to service the overhead lines and aid grid workers at dangerous heights owing to which the market will witness steady rise. The lack of awareness of project management techniques, non-availability of trained employees, low usage of high-performance technologies, and weak infrastructure are resulting in inadequacies, which are creeping into construction projects thereby impacting the market growth. However, to accelerate the pace of growth, it is imperative for the industry players to overcome the challenges of the level of awareness among the workers. Rapid developments and investments in the power distribution sector across the globe is an important factor driving the mobile crane market growth. The machines are being extensively used for maintenance and construction activities in power grids. Several countries in Asia Pacific are using mobile cranes to establish a robust power grid infrastructure to support the increasing electricity needs of the ever-growing population. The utility sector is capitalizing on the lack of traditional infrastructure in the region to help the rural communities in gaining environmental, economic, and social benefits. In addition, the infrastructure industry expansion and the initiatives undertaken by several regional governments to enhance the existing utility infrastructure is propelling the mobile crane industry demand. Growing requirement for cranes has been witnessed in the infrastructure development, particularly in urban infrastructure. Government administrations in several emerging economies have renewed their focus on the development of urban infrastructure projects, such as airport developments and smart cities, owing to which a sharp increase in demand for the crane industry has been witnessed. In the crane market, the oil & gas industry accounted for around 20% of the overall revenue and is anticipated to grow at a steady rate over the forecast timespan. Tower cranes are an important part of the oil rigs and are used for the daily operations such as lifting of drill pipes, casing and for lifting maintenance equipment from the ships among other operations. They are majorly used for moving heavy materials across the oil platforms or rigs and can be installed on wind energy parks, production platforms, and drilling rigs, and are designed to work in the most severe weather conditions. The constant increase in global energy demands and the discovery of more demanding sea beds has led to considerable changes and requirements of crane technologies which is providing an impetus to the market. Rise in adoption of cranes is expected to accelerate owing to the expansion in the cement plants and infrastructure development. The construction and transportation sectors are the major segments contributing towards the adoption of mobile cranes with many on-going projects coming in their way. The U.S. crane market share accounted for over 80% of North America revenue generated in 2016, with construction and retrofit market growing at a significantly high pace. The industry witnessed sluggish growth over the last couple of years, however, despite the sluggish growth, the industry is predicted to showcase some growth in its development and will witness growing demand for upgradation of the equipment in the coming years. Countries in Asia Pacific and Europe are using mobile cranes to establish a robust infrastructure to support increasing needs of its population. The utility sector is capitalizing on the lack of infrastructure in Asia Pacific countries to help the rural communities in gaining environmental, economic, and social benefits. Renewable energy and smart technology are anticipated to change the way of operation of energy and utility sectors thereby impacting the market demand positively. 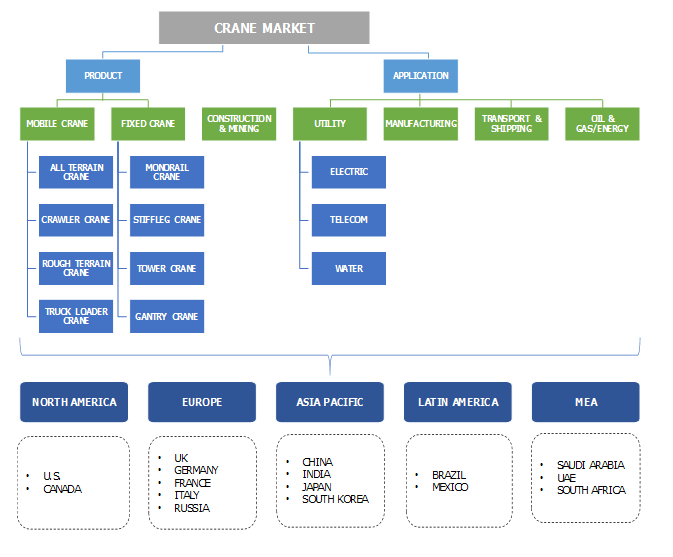 Major players operating in the crane market include Palfinger AG, Terex Corporation, Kito Corporation, Komatsu Ltd., Konecranes PLC, Liebherr Group, Tadano, Ltd., XCMG Group, Kato Works Co. Ltd., Cargotec Corporation, Columbus McKinnon Corporation, Hitachi Sumitomo Heavy Industries Construction Crane Co., Ltd., Manitex International Inc., Altec Inc., Elliott Equipment Company, Ingersoll Rand, PLC and Manitowoc among others. Several vendors are focusing on developing innovative product portfolios and launching effective partnership for industries such as utility, construction & mining, manufacturing, transportation & shipping, and oil & gas. The vendors are facing intense rivalry based on brand, quality and service. The manufacturers in the crane market are increasingly focusing on automation and technological advancements in the equipment, coupled with the growing requirements for safety & productivity and rising safety requirements for the machines. Companies are using advanced control technology for accurate signal collection, high degree of safety, and rapid speed calculation to make the cranes safe, efficient, and flexible. Rise in urbanization has prompted the regional government administrations to focus on modernizing and revamping the legacy buildings which is adding the crane industry growth. Energy efficient products, such as electric cranes, will witness high adoption and solid gains as end users are seeking to reduce costs.